Email info@edensproject.co.uk for general enquiries. Stuart Ayling (Manager & JNC Professional Range Youthworker) 37 hours per week. Graduated from Moorlands College with a NYA & JNC endorsed degree in Applied Theology (specialising in Youth & Community Work) in 1999. 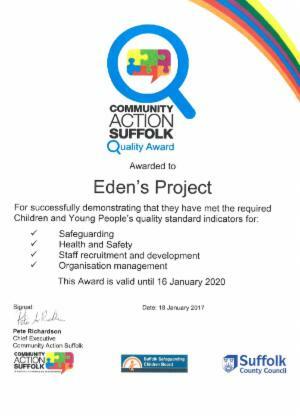 Worked as a Youth & Community worker in London for 4 years before joining Eden's in Sept 2003 as the Youthwork Manager and was promoted to Project Manager in June 2007. Stuart is a keen swimmer and footballer and fan of Manchester United. Stuart lives locally with his wife Jude and their 2 daughters. Stuart is the main contact for the youthwork side of Eden's Project. Jude Ayling (Youthworker & Admin Support) 16 hours per week. Warwick University Graduate with hons degree in Psychology & Education in 1999. Worked as a Youth & Community worker in London for 4 years before joining Eden's in Sept 2003. Volunteered for Victim Support and had specialised training in helping victims of sexual assault and domestic violence. Jude also completed the Introduction to Counselling course and a course in Listening Skills. Jude lives locally with her husband Stuart and their 2 daughters. Jude works part time for Eden's in the office on Tuesday, Wednesday and Thursday 9am-3pm and as a youthworker on Friday evenings and is the main contact for the Youth Support Services. We also have sessional youth support workers as additional staffing at some sessions.